Monday 20th August: No choice but V8 or it's too late. Hi all - well an interesting few weeks has come and gone since our last update. On a very positive note we reset the European Japanese records again at Jap Show with a backed up 6.63 secs and virtually 212 mph which was great news. We then travelled to Hockenheim and obviously those track issues have already been well documented so i'll say no more. At the weekend just gone (Sat 18th) we ran at Rotorstock back at Santa Pod and were straight back into the 6's and picked up another win in the Pro Class (our 3rd one this year). To finish this busy period off we now race in Sweden this week for the first time in a hugely competitive Competition Eliminator field (30 cars entered) and will obviously do our very best to make a fight of things. The last few months has really seen us as a team reflect on a wonderful last 5 years but more importantly consider our plans for the next few years. This has involved a fair bit of soul searching to a degree in terms of where do we want to be and potential engine choice sacrifices made. As everyone is well aware as a team we are absolutely Japanese power through and through, this however been brutally realistic seriously restricts us in relation to the classes we can enter and the type of racing (heads up) that we can enjoy. The team has been hugely succesful in terms of bringing superb sponsors onboard over the last 3 years and it is paramount that those sponsors receive maximum exposure, support and enjoyment from us. We have literally done everything there is to do in Europe from a Japanese scene, being fortunate to win various championships, set and hold various records and right now we do not have any serious competition at all close to home on a regular basis - some may say that's no bad thing but for us it is - we revel in competition and this has really accelerated the next step for us. 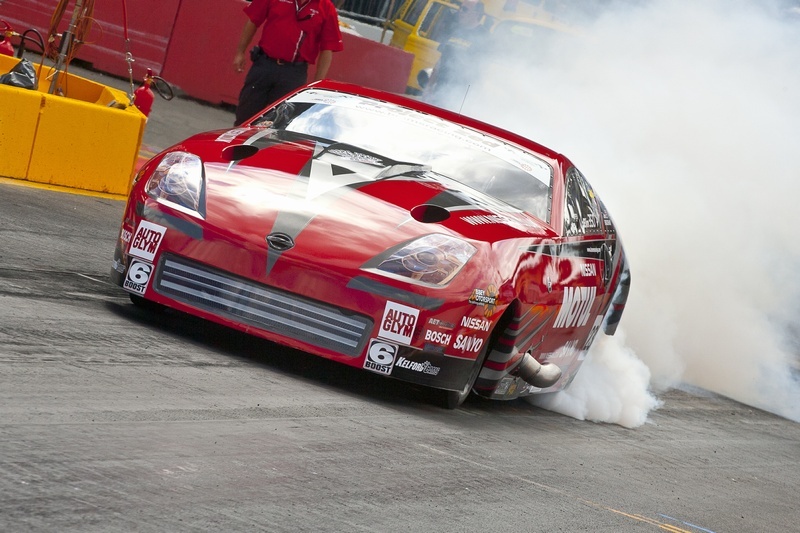 Project Zed will run for a final time at Japshow Finale in September at Santa Pod, this will be the cars last appearance in the UK and for those who have wanted to see the car but not yet had the chance, we hope you can make it. The car will then be shipped over the winter to Australia where we will run in Sydney in March against the fastest Japanese cars on the planet - we will then either leave the car there to run in further competitions or decide to sell the car in Australia. We had hoped that a Japanese powered V6 engine would be allowed to compete in MSA Pro Modified as due to it's small size (planned 4.0 ltrs) could not be considered unfair in any way, sadly we now realise that this will not happen as the wheels of potential rule changes would never move that quickly, we considered Top Doorslammer but without a decent size class in the UK that is also not viable. 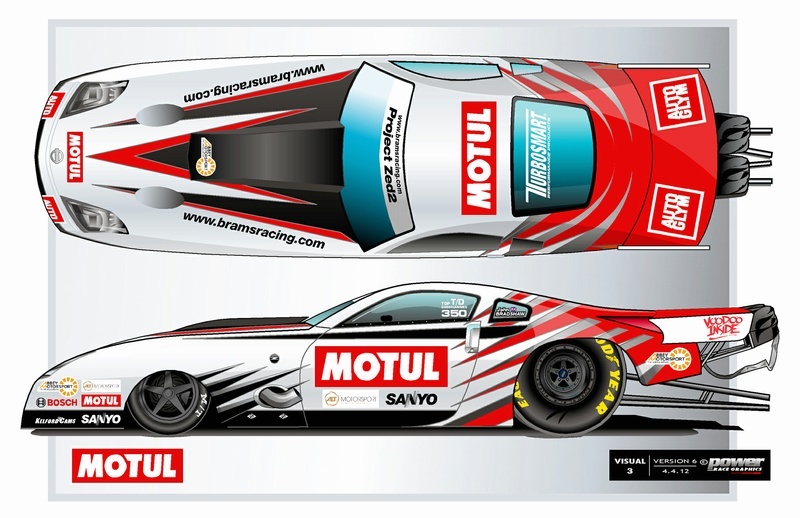 So the main option left to us was to swallow that slightly bitter pill and consider a twin turbo V8 and to go Pro Mod Racing. 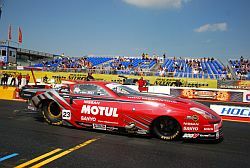 So Pro Mod racing - that's exactly what we intend to do - as a team we want to be able to invite our sponsors to events knowing with certainty that they will see our car, knowing they will see our car on satellite TV, knowing that we will compete in a hugely ferociously competitive class, knowing we can race heads up. Project Zed 2 is inbuild currently, we had planned to install a 4.0ltr Nissan V6 which we hoped could run very very low 6's - this has now been changed to a V8 twin turbo that we hope will see 5's eventually. The car may now need a few minor tweaks to reflect the change in engine configuration (gearbox, rear axle etc) to bring it in line with the very best specs and parts available. We are under no illusions that Pro Modified will be daunting, challenging and tough for us but as a team we have grown hugely over recent years, learnt an awful lot and shown glimpses of absolute brilliance in relation to showing how well a 3.5 ltr V6 can get off the line and run 6 after 6 after 6 second run, we have good knowledge in relation to clutch set up, extensive turbo knowledge so in time we hope to be very very competitive. Being realistic I do not expect the car to compete fully in either the FIA or MSA Pro Modified Championships until 2014 - we intend to do what we have always done, take our time, make the best of what we have and make big improvements every year. A huge thankyou to everyone for their amazing support over recent years, it's the start of the next phase for me as a driver and us as a team now, we may well still enter the odd Jap competition with our original car Project GTST which still holds the world record for a Nissan Skyline (7.45 @ 187 backed up in 2008). Wednesday 20th June: Jap Show. Hi all - well what an eventful event Japshow was for us ! Saturday was the day of the horrendous winds - straight off the trailer, we saw sixes with the car running a 6.64, into a horrendous headwind, which was just superb, our 60ft down to 1.01 on a rwyb track really shows the move to a five speed is the right decision. Race day Sunday saw us make five runs in total - on the first we had horrific tyre shake, which broke part of the suspension within the first 60 foot. A huge thank you to the guys who helped with the loan of their welding equipment and helped us repair the damage. A few tweaks and then 6.75, 6.63 and 6.64 - brilliant stuff - all of those runs saw some tyre shake, but not bad enough to have to lift off. The final run was eventful, with the car going hard right towards the wall, up on two wheels but thankfully back under control- no one can say that we were not trying! We now have a month off before Hockenheim and then Tierp. The team is full of confidence and we are now at a place where our best last year is a "normal" run this year which goes to prove just how much we have pushed ourselves again. Motul, Nissan, Autoglym, AET Turbos, Bosch, Kelford Cams, Ferrea, Headworks, Darton, 6 Boost and Turbosmart. Thursday 14th June: Summer plans, and regrets. Well I'm genuinely surprised that we don't all have webbed feet and hands - our British weather needs to change and change quickly! The Main Event for us was always planned as a test session with us pitching up on the Thursday and leaving on the Saturday, we purposely put an 8.99 on the back window so as not to interfere with qualifying and that thankfully worked like a dream. We are very confident now that reverting back to a five speed box is the way forward; we have been running with a four speed for over a year now and it's time to move the car forward again. We are confident that switching to a five speed and increasing the amount of boost on the start line will see us get very close to sub 1.00's 60 foots for the first time and also confident that it will help us get into the 6.4's or less sooner rather than later. We have JapShow coming up this weekend and are crossing all fingers and toes that the weather will be kind just for once! The event is an exciting one for us as it sees the launch of the Brams Racing Trade Stand - this is a big moment for us as it has involved an awful lot of conversations with numerous sponsors to get it to the point of conception. This will be a sign of things to come with Brams Racing and its sponsors working very closely together to really help each other where possible and also hopefully the venues that we race at. The stand will be 12M long X 8M wide and house a new very special road/race car from our turbo sponsor and manufacturer, AET Turbos (and a new trackside sponsor to Santa Pod) who have the exclusive rights to the race car in the UK; the stand will also feature a Motul lounge and a full Motul product display with the full range of oils on sale via Abbey Motorsport including Motul's 300v engine oil which Project Zed happily runs on. We will have Brams Racing and Motul merchandise and clothing for sale and going forward we will have numerous exciting cars on display that we actively encourage the public to get close to, touch, sit in and feel part of (including our new car Project Zed 2, Project GTST - still the world's fastest Skyline) and Abbey Motorsport will also have a dedicated area within the stand. Post JapShow, we have quite a long break (the whole of July) until Hockenheim, which we are really looking forward to, which is quickly followed by Tierp - what a month August will be! At both events we can run in Competition Eliminator, a very competitive heads up class with NO breakout - this is key for us and a format which we are happy to invite our sponsors to - we will be looking to get a large contingent of sponsors to Hockenheim to really give them a taste of large scale drag racing. 1. Due to an awful lot of hard work over several years, we are fortunate to now have a large number of fantastic and loyal sponsors and this has seen our income and available budget rise to substantial six figure numbers - we owe it to them to use it wisely and to gain maximum exposure - we cannot gain this from running in a bracket racing class which does not suit the car, which is a class which no newcomer or sponsor will ever understand when arriving to view and expecting them to lose a weekend out of their busy schedules by coming to view and then being disappointed by not understanding what's happening or, even worse, not seeing the car run at all is unrealistic and unacceptable. 2. Our budget is far better spent on attending events where we race competitvely, in an easy to understand race format for newcomers where both sponsors and their guests will be able to follow what's happening (win or lose) and want to come again and again and potentially invest more into the team and hopefully the sport in general. 3. We need to start pushing ahead with our goal to become even more competitive on a global scale for a Japanese powered car - to do this we need to be racing with the best competitors in the world and a large portion of the team's budget will go towards shipping Project Zed to Sydney over the winter to race with the best in the world at the Sydney Jambo in March 2013. 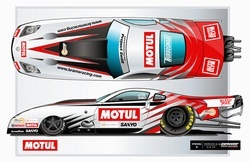 The car will stay in Australia for 2013 and we will race in two other events in Australia later on in the year. Project Zed 2 will be used in the UK in the Japanese JDS series and in Competition Eliminator events in Germany and Sweden. We really hope that the UK will bring back Competition Eliminator in 2013, or introduce a competitive heads up racing class for sub 7 second doorcars similar to the very successful Top Doorslammer race series run in Sweden. This is not something that we can rely on though, so the team will be looking to race elsewhere in Europe should this not be the case. We constantly get asked the burning question by many many people at events "so why can't you run in Pro Mod" or hear "we would love to see you in Pro Mod" - the simple answer is so would we, but even with an engine that's at least half the size permitted, because it's minus two cylinders, its not allowed. We can't even use a Nissan V8 due to it being to "modern", i.e. twin overhead cam, which to us seems ridiculuous as surely technology should move forward as in everyday life. Should the answer then be for us to switch to a permitted V8? For us absolutely not - our car, our methodology, our team, our sponsors are all interested in current technology, current development and pushing the boundries - this can then be understood by the huge number of road car users who also modify their own road sports cars - that's quite simply why we are so fortunate to have a great following. Our race car uses the same Nissan engine block thats also fitted to many many thousands of Nissans on the road today. Anyway - on with JapShow, and then it's a great rest and Europe - fingers crossed, we all enjoy a fantastic remaining summer and autumn. Monday 28th May: Doing it differently. Well hello everyone and welcome to the Brams Racing blog. I hope over the next few entries we can give you a flavour and an idea about the team, the cars and the methodology as to what we stand for, why we continue to do things slightly differently i.e. V6 not V8 and just how much development, time and combined team effort goes into making a 3.5L Nissan V6 run 6.6 and hopefully even quicker in 2012. I won't go right back to the start i.e. 2006 and our infamous 2.8 L RB26 Nissan Skyline (Project GTST) as thats been well documented over the years. I would much prefer to start from what we have now i.e. Project Zed - currently Europe's fastest Japanese car (6.63/209.8) and our new car Project Zed 2. 2011 was a superb year for the team with Project Zed consistently running sixes all year from the word go, winning the JDS Pro Class, winning at Hockenheim and winning multiple events - it was a superb team performance and a year we were rightly proud of. 2012 - well that started with the Autosport show back in January where we had the car on display in conjunction with Motul, similar to everyone else though after a long winter the only thing on our mind was getting back to racing. The Easter Thunderball as we all know saw the worst of what the British weather could throw at us and we failed to get one decent run in, cancelled test days followed and the teams' (Brams Racing and Abbey Motorsports) frustration grew to new heights. Our last run of the season in 2011 was also our best (6.63/208.9) and we know we can definitely go faster - we just need the weather to do it! The car was packed, the truck ready and we all headed over the water via Folkestone to Calais, a few hours later we arrived to massive crowds and a real sense of excitement. The car took pride of place outside of Motul's huge building for the weekend and crowds constantly thronged around the car, we were performing in the Saturday night show (40,000 + expected) and couldn't wait - then yep that dreaded word came and boy did it come - RAIN! Four hours of solid rain had us thinking we would not be able to run at all and with literally minutes to spare it stopped, lots of standing water around and we all looked at each other and thought do we/don't we - the noise from the impatient crowd was enough to have the hair standing up on the back of our necks and we literally ran to the truck to get the car up and running in no time at all - what followed next, well a massive amount of noise, the car visiting each grandstand and showing the crowd what it sounds and looks like on the two-stage rev limiter - lots of noise from us and the crowd and a lot of smiley faces - you can tell how loud the car is when all the Moto GP mechanics are clapping madly :-). So next up is the Main Event - we will race at the Thursday test day, Friday and Saturday and then pack up - the event for us is all about testing as with no Competition Eliminator available we need to ensure we use our budget wisely - I'll come to that in our next update after the Main Event - see you there!